Fan Feedback: What’s Your Poison? Let me tell you about this writer’s gaming plans for the next few months. First, I’m going to finish the new Final Fantasy. That shouldn’t take too much longer. Then, I’m moving onto Digimon World: Next Order, and there is not a single joke you can make about this that I haven’t already made myself. Following that patch of shame, I’ll be moving onto Mass Effect: Andromeda, which I hope to have finished before Persona 5 comes out. I don’t know if you can tell, but I’m really into RPGs. Don’t get me wrong, during that time I’ll also be playing plenty of Overwatch and Elite: Dangerous as palate cleansers, but very little gets a bigger thrill from me than a well executed RPG for me to lose myself into. Of course, when looking at the larger gaming community, it’s obvious that there are other tastes out there. What does Counter Strike: Global Offensive offer someone accustomed to turn-based mechanics? (Painful, brutal delight, that’s what.) Because of it’s hundreds of thousands of monthly players, we recently decided to ask what sort of game you spend the most of your time playing! Is it goofy to be very proud that the Role Playing category took this one? It just barely beat out the popular Action/Adventure category by 2%, but we role players tend to be a neglected bunch, so the show of camaraderie felt good. That said, I really want to talk about Shooters, because I find the results there fascinating. Sure, they were more popular in this poll than Puzzle games, and sure this poll most likely finds its way to a specific demographic, but still! 10% towards Shooters is such an astounding drop! Just a couple years ago this genre was the king among kings in gaming, but to find an audience with such indifference towards it is jaw dropping. That audience–you guys–is the important take away from this though. Whether or not games are stepping away from shooters isn’t the point though. I doubt a twitter poll, even without a limitations on number of options, is all it takes to track the most popular genres at any given time. What matters is that somewhere out there in the world exists a group of gamers that would be on board with what we hope to achieve in Gears of Eden. 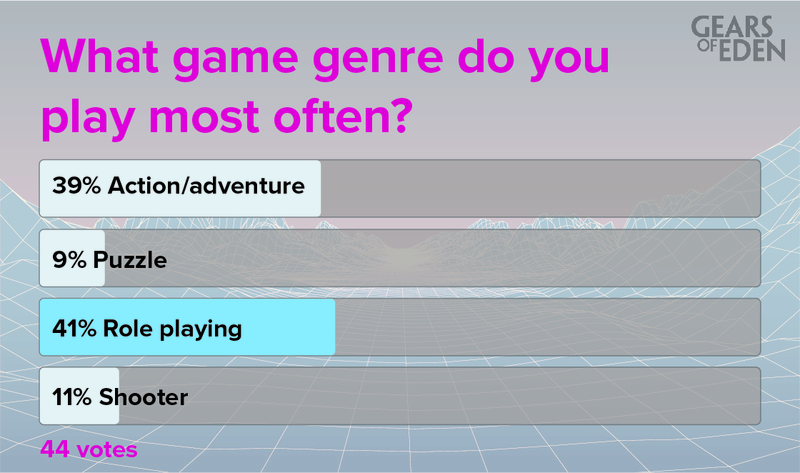 Like many developers out there, we’re pulling from many genres for our influence and direction, but when I look at this poll … well, it feels like you just might end up liking our little game. Gamers, what #game genre do you play the most? #gaming #gamedev #indiegame #indiedev #gamersunite https://t.co/5Yjw9JJXkp RT! I can’t wait until you can play it! I’ll have to wait though, because game development takes a while. Instead, above you’ll see our latest question to you on Twitter! This week, we’re asking about gaming’s latest craze: VR, and I look forward to discussing it again next Monday! If you want to continue being a part of the discussion, be sure to follow us after you vote! I’ll be back in a couple days with another Dev Update, so I hope you have a great week until then.